If it isn't selling, chances are it needs to be staged: a "quick fix!" One definition of Home Staging is: preparing a residence for sale (occupied or not) for the real estate market. In this economy people are concerned with getting a good return on their real estate investment. When I stage, I minimize expenses yet get the job done. As an interior designer, while visiting family and friends I would find myself rearranging their interiors. My work would enhance their homes, by getting rid of mistakes that they could not see. You can take my staging tips (below) and apply them, but if you are ignoring the black holes, also known as tragic flaws, your house won't sell for the price you want. The tragic flaw is a dreadful mistake that needs to be fixed immediately. These are generally invisible to the owners, otherwise, they would not exist. Unfortunately, potential buyers can detect them. They know something just doesn't feel right. Oftentimes, these black holes can be rectified for under $100. Each day that your house does not sell is a day you are flushing money down the black hole. Buyers need to like what they see immediately and be able to imagine living in your house. For example, a recent client had a poorly executed portrait of her children executed in needlepoint and covering her bed. 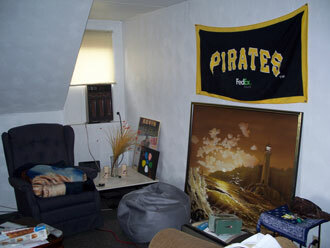 I had her remove this and rearranged her furniture so the room looked larger. She didn't even have time to take my suggestion of placing lights at the end of her large backyard, so clients could see the size of it at night, because the house sold immediately. Staging can create visual interest, illusions, atmosphere, and drama for little money. Staging works in formal or contemporary settings. Even a house with good detailing can lack finesse. 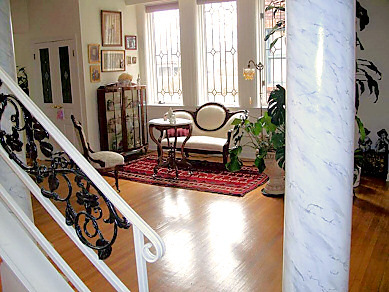 Putting a faux marbleized finish on previously plain white columns softens the visual impact in the entry and ties in with other real marble detailing in the area. Adding cast iron panels ($30 each) to an open iron railing gives safety and drama; while tying in with the addition of simulated leading on the windows. 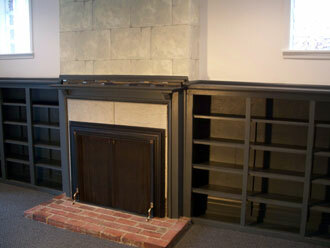 These simple inexpensive enhancements transform a stark contemporary room into a dramatic traditional environment. In this example, a bland foyer was given panache for less than $100 (plus artwork). The vintage double theatre seating cost $25. It provides functional seating as well as a visual focal point. Stone wall covering above, used brass and mesh screen (brass legs cut in half), and molding - all glued up to create old world charm. Total cost for materials $125, Labor $135. While you can become certified in this field and call yourself a stager, nothing teaches as well as experience. I have a degree in interior design from FIT (Fashion Institute of Technology) in NYC, but I feel that my many years of experience is what enables me to do in two hours for $250, what might take others longer and end up costing more. After that session, if additional work is needed, I prioritize, giving the client a list. Often clients are able to execute these ideas themselves. If not, I am available for additional support. Budget is always an important consideration. Where can you find a professional designer who can solve so much so quickly for so little? My clients often tell me how relieved they are not to have to make all these decisions themselves. Staging can save you thousands of dollars instead of your having to lower your asking price. 1. How did you get into home staging? As an interior designer, when I visited family and friends, I would constantly rearrange their interiors and enhance their spaces using what was on hand, giving them a more and getting rid of tragic flaws I didn't realize that a business was as being born! 2. Have you seen an increase in people interested in home staging? Absolutely! People are realizing that the right staging gets the right price. 3.What are the benefits of staging your home? It makes your home more enjoyable to live in and it helps sell it quickly! 4. How much value can staging add to a home's price? Staging can help you get the price you want. You will find that if you hire the right professional, it is well worth it. 5. Any before & after success stories that stand out? A recent client had a portrait of her children done in needlepoint as a coverlet for her bed. 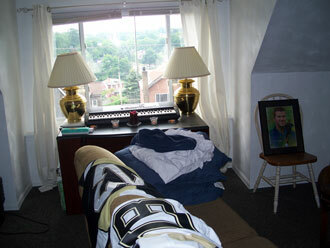 I had her remove it and move her ottomans closer their matching chairs to make the room look larger. The house sold immediately! She didn't even get to use my other suggestion of placing lights at the end of her huge backyard, so clients could see the size of it at night. These suggestions didn't even cost my client a dime! Does your house have a tragic flaw? 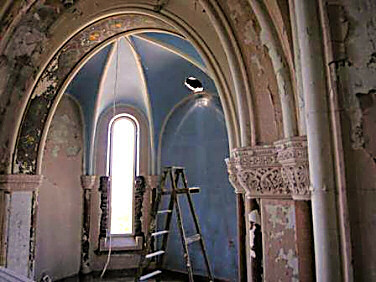 I was the interior designer for the model at Angel's Arms, a Romanesque church turned condominium in Pittsburgh, PA. The model was featured in PITTSBURGH MAGAZINE in an article on converted churches, October 2007. Before I began this project, the owner was ignoring the existing fantastic architectural elements and wanted to modernize the unit. I suggested emphasizing the existing architectural elements to add more drama. The owner loved it so much that he moved into this space. He told me he could have sold his unit 20 times over as everyone wanted it. 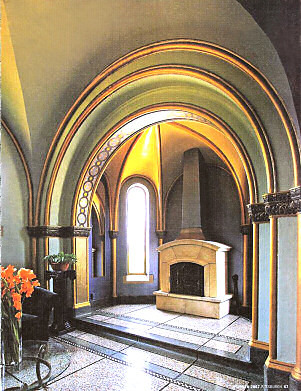 photo (above) This living room in one of South Side's Angel's Arms apartments was once part of the sanctuary at Saint Michael the Archangel Church. 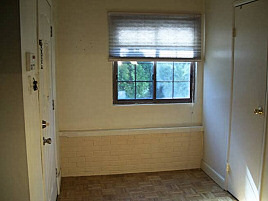 The same space before the renovation was begun. This is an example of something that is far more than staging. I wanted to recreate the look of time and history, but still update it to encompass current taste and lifestyle needs. Mirrors create the illusion of more space and light -- simulating additional windows. The rewards of paying attention to detail are evident here. 6. Know of any interesting staging/sales statistics? No. But I am always surprised that instead of hiring a stager (whose work you love), the homeowner keeps lowering the price by thousands. 7. What are some of your favorite staging tips? If you decide to stage, you can get by using proper lighting, minimal furniture and some accessories. If you are moving and the space was successfully decorated, take several photographs and use frames that complement the room. Make the photos large enough. They will double as art for the space and also give the perspective client a feel for what the space looks like furnished. 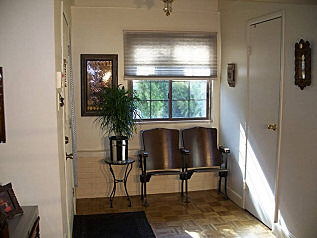 The prospective buyer should want to sit in a seating area. It should be inviting. When in doubt, keep furnishings simple and think about the traditional design aspects of hotel rooms and lobbies. Potential buyers don't necessarily have the same taste in all your carefully collected knick-knacks. So box them up and label properly. Don't fret, your stuff isn't going to Siberia, it is just in another part of the house. In main areas, to increase the sense of space and visual flow, neutrals are the way to appeal to a broader audience. I like to treat the walls differently in at least one room of the house. Too much of the same can be boring. Speaking of boring ... I really don't like everything white but lots of designers do. It can be a great look -- especially if you've just had your teeth lightened, you make everyone take their shoes off upon entering, you don't have children or pets and serve only clear drinks. Visual variety is important; everything shouldn't be the same height. Window treatments should be neutral and soften the room. Simple inexpensive draperies add grace to a room. You get a huge bang for your buck using proper lighting, custom painting or the perfect wall covering. But, you really need to know what you are doing, especially if you choose the latter. When I use wallpaper, you don't even notice - there is just an added dimension. Adding a large framed mirror not only adds more interest and light to a room but the prospective buyer can envision themselves in your space. Taller baseboards installed in at least one room give the illusion of a rich interior. Twelve dining room chairs are not necessary especially if your room isn't gigantic. And yet, I come across this often. Updating a kitchen is essential beyond the obvious requirement of replacing worn appliances and countertops. Finessing details such as installing interesting hardware, adding trim or changing cabinet doors, sanding and staining or painting can transform a kitchen. Under counter lighting should be installed. Fluorescent lights just don’t do it for me….or the room. If using hardware knobs and pulls, they should not all be the same. It is probably a good idea to buy updated (not necessarily modern-looking) spigots for both kitchen and bathroom sinks. This is a small fix with a big impact. If the house has no curb appeal, are they going to keep driving? If the budget allows, things can be done outside to enhance and make the house more inviting. 8. What's one of the stranger things you've encountered on the job? People’s reluctance to change. For example, insisting on keeping a pedestal sink when the bathroom is tiny and has absolutely no storage space. 9. What's your average day like? Being in a creative field, each day is a different challenge. I love clients that are able to embrace the possibility of change. 10. What's your favorite part of your job? Seeing the results and watching the reactions of the owners when their houses sell quickly. 11. How about a least favorite part? Husband and wife disagreements and reluctant to change clients. 12. What are some inexpensive ways of "staging"? Adding, mirrors, plants, and rearranging what you already have (which I enjoy). Adding lights in and around trees or shrubbery. Gentle Feng Shui where needed. 13. 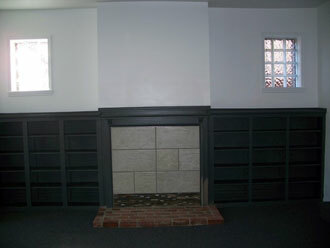 How about some options for someone willing to pay a little extra to stage their home? Borrowed light, windows, skylights, adding architectural enhancements, decks, landscaping, custom painting, wall coverings, and new flooring. 14. Any definite "don'ts" when showing a home? The biggest mistake that homeowners make when showing their house is having too much personal stuff displayed. Reduce clutter and things that distract the visitor from imagining how they might fit into the space. 15. Do you have a favorite job you worked on? I was The Senior Designer (Vidal Design Associates) for Waste Management's new corporate headquarters in Fort Lauderdale, Fl. For this project I had complete freedom to work with the materials and techniques of my choice -- leather, marble, borrowed light, etched glass -- to set the stage for a successful stylish corporate atmosphere. 16. What makes a good stager? Being able to do the "quick fix" and paying attention to the budget! Ok landlords, so what do you do when tenant's lease is up August 31 and you know if you show it as is, and you will be stuck through the winter? You stage it of course, hopefully, when the tenant isn't there and with his permission. I used his sofa along with my throw to cover the hole in it. 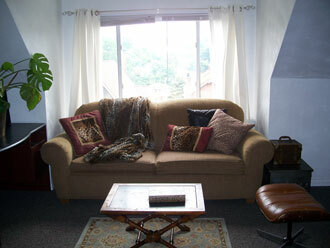 I brought over pillows, accessories, plants and area rugs. This unit rented immediately. 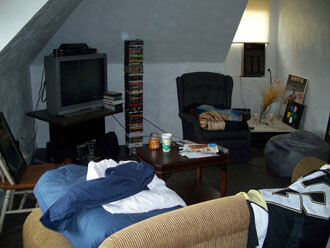 Just for laughs, this is the rest of that room. My assistant walked out and came back - she was overcome with hopelessness. Initial staging before placing the house on the market is the ideal choice because I can decide which furniture and accessories will look best to get the house sold. Even if you plan on moving, I prefer choosing the minimal amount of furniture needed to make the room look best. Make sure your home is in the best condition it can be in before I walk through the door. If living in the house, getting rid of clutter is a good place to start. If your house is already on the market and you aren’t getting offers in the price range you expect, you need to consider staging. Don't be afraid to admit you need help!